This post has been adapted from a chapter in my MA Thesis which was completed under the supervision of Dr. Heather Shore. 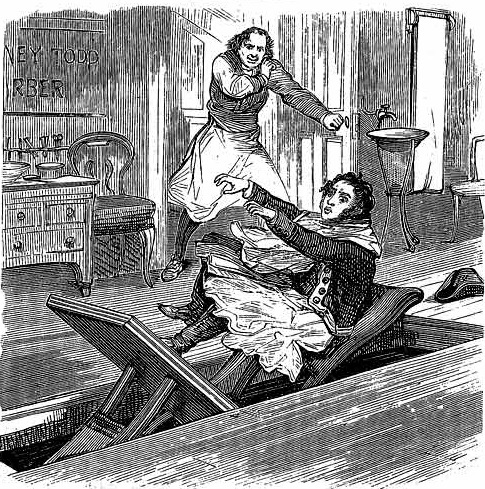 The tale of Sweeney Todd, the ‘demon barber,’ (originally entitled A String of Pearls) is perhaps one the most famous penny bloods of the nineteenth century. The story is set during the 1780s ‘when George the Third was young’. It begins when a young gentleman returns from overseas intent on marrying his fiancée, Johanna. He is carrying a gift of a string of pearls which he intends to give to her. Before visiting her, however, he decides to go for a shave. Both the gentleman and the pearls go missing. Investigations begin into the missing gentleman’s whereabouts, and suspicions are raised in London when Todd attempts to pawn a matching set of pearls because he cannot give ‘satisfaction as to how he came by them’. Subsequent investigations into Todd’s business reveal that there are many valuable items of all descriptions kept within his residence. The outcome of the subsequent investigations reveals a horrifying truth. The owners of the valuables have all been killed by Todd. With the collusion of his neighbour, Mrs. Lovett, who runs a pie manufactory in which she has imprisoned numerous subterranean workers, the victims’ bodies have been served up as meat in her veal pies. There was a piece of the flooring turning upon the centre, and the weight of the chair, when the bolt was withdrawn, by means of a simple leverage from the inner room, weighed down upon one end of the top by a little apparatus, was to swing completely round, there being another chair on under the surface, which thus became the upper, exactly resembling the one in which the unhappy customer was supposed to be ‘polished off’. There was an image which accompanied the text that illustrated exactly how the intricate machine worked (see above). Todd runs an extremely tiny corporation…he murders his barber shop clients and sells their bodies as ‘veal pies’ with the help of Mrs. Lovett…and a nameless sequence of subterranean ‘pie manufactory’ workers who may not leave the factory floor and are quietly killed when they become exhausted or unmanageable. Penny dreadfuls, targeted as they were towards the working classes, thus expressed working-class fears surrounding urban living and industrialisation. This is true in both The Mysteries of London and A String of Pearls where these fears were as Crone says, ‘clothed in everyday dress’. Crone, R. Violent Victorians (MUP, 2012). Hobsbawm, E. (1952). ‘The Machine Breakers’. Past and Present 1(1). Marx, K. & Engels, F. (1848:2005). The Communist Manifesto. Oxford: Oxford University Press. Nevsett, R. (2014). ‘Welcome to the Pie Manufactory: Sweeney Todd and The String of Pearls’. ETHOS. [Internet] http://www.ethosreview.org/cultural-interventions/welcome-to-the-pie-manufactory-sweeney-todd-and-the-string-of-pearls/ [Accessed 04/08/2014]. Powell, S. (2004). ‘Black Markets and Cadaverous Pies: The Corpse, Urban Trade and industrial Consumption in the Penny Blood’. Prest, T.P. (1846). ‘A String of Pearls: A Romance’. Mack, R.L. ed. (2007). Sweeney Todd: The Demon Barber of Fleet Street. Oxford: Oxford University Press.